Edmund G. Farfour, 94, also known as “Slugger” passed away at Kitty Askins Hospice Center in Goldsboro. Edmund was born in Goldsboro on December 01, 1924 to George and Freida Farfour. Edmund attended St. Mary’s Catholic School and Goldsboro High School where he ran track and played tennis. Edmund went on to work at Music & Sports for over 40 years. Most recently you could find Edmund behind the customer service desk greeting customers at Carlie C’s until failing health forced him to stop working and stay at home with his wife and love of his life of 60 years, Joyce. Edmund was an active in the community. Edmund joined the Goldsboro Optimist Club in 1957 and was the only charter member left until his death. Edmund was awarded the Optimist of the Year and the Christian D. Larsen Award. During the holiday season, Edmund could be found at the Optimist Club Christmas tree lot where he met and greeted many people. Edmund worked the lot for 60 years. 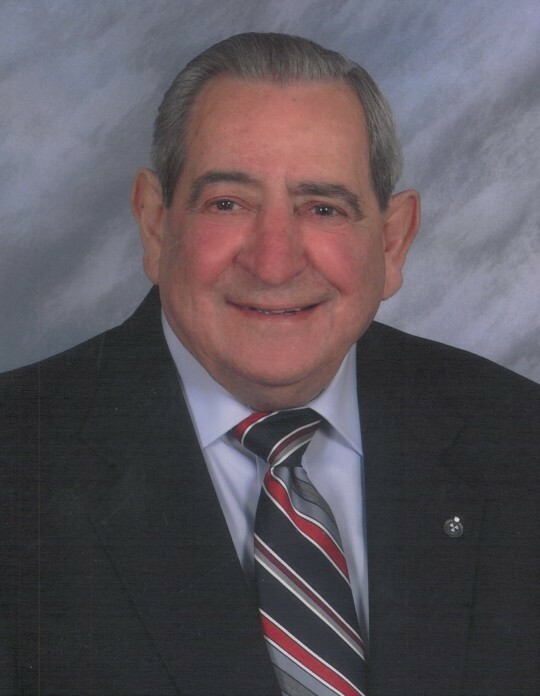 Edmund was also a member of the Travelers Protective Association of America where he served many offices to include post president and secretary, state president and state membership chairman for several years and was on the state board of directors. Edmund was the high writer in North Carolina for over 25 consecutive years. Edmund served on the national level as third national vice president and received TPA’s highest award, The State Merit Award as well as The National Merit Award. If you couldn’t find Slugger at home, he would be at the ball “diamond” either coaching or umpiring ballgames or just “scouting” players for his one of many teams. Edmund had a passion for sports especially, Slo-pitch softball where his team, Music & Sports, won many city championships as well as his travel teams. Edmund traveled all over with his teams. The most notable team was The Jukebox where his team won the state championship as well as the world championship winning a total of 21 tournaments that year. In 1997, Edmund was inducted into the United States Slo-pitch Softball Association Hall of Fame. Edmund played many sports, softball, tennis, golf, bowling and loved the UNC Tar Heels. Edmund was the longest living member of the Saint Mary’s Catholic Parish until his death. Edmund served as head usher for as many as 50 years and was a member of the Knights of Columbus. Edmund is survived by his wife and love of his life of 60 years, Joyce Cooper Farfour; his son, Richard E. “Rick” Farfour and grandson, Matthew R. Capps and many nieces and nephews. Edmund was preceded in death by his parents, Freida and George Farfour; brothers, Leslie Farfour and John Allen Farfour; sisters, Louise F. Baddour and Agnes F. Harris and a very special daughter, Freida F. Capps for who he called “Princess”. Edmund was a good father, brother and friend to many never meeting a stranger and always greeting them with a “Slugger”. He will be missed by many. The family will receive friends Thursday evening, March 28, 2019 from 7 until 8: 30 p.m. at Howell Funeral Home & Crematory in Goldsboro. A Mass of Christian Burial will be held Friday, March 29, 2019 at 11 a.m. at St. Mary Catholic Church in Goldsboro. Burial will follow at Willow Dale Cemetery. Although flowers are welcome, memorial contributions may be directed to St. Mary Catholic Church. Services entrusted in the care of Howell Funeral Home & Crematory in Goldsboro.